Two days ago I had surgery to remove an ingrown toenail, and the doctor prescribed a cocktail of drugs to help me recover. 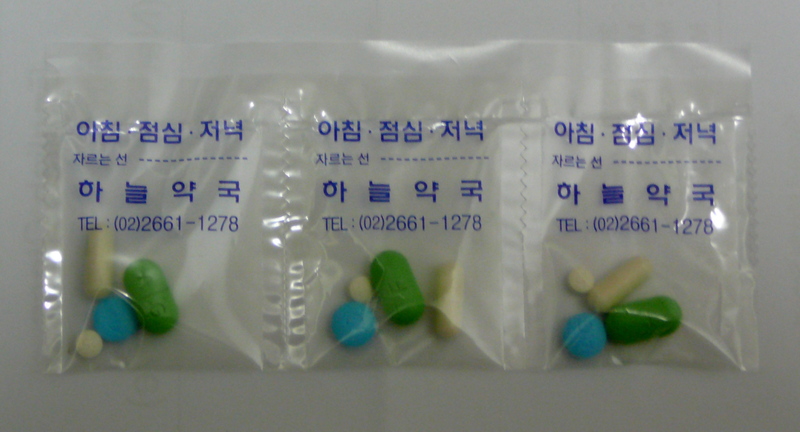 If you've ever had a prescription filled in Korea, you are aware that pharmacies never give you (or even show you) the bottle, labels, or any printouts for the drugs that they dole out. Instead, they arrange all of your pills in convenient single-dose packets that you can tear open and take all at once. The obvious drawback is the lack of information about the drugs. Coming from America, where the corporate medical machine's rewarding of over-medication requires a healthy suspicion of doctors and prescriptions, this practice can be quite off-putting. In general, though, Koreans trust their doctors and follow their advice. Yesterday, during my day-after follow-up visit to the surgeon, he informed me that I could stop taking the painkillers. The only pain I experienced from the surgery had subsided about 8 hours after the surgery, so I didn't need it anymore. Since I didn't know which drug was which in my string of plastic baggies, I pulled it out for the doctor to identify. He looked at the group of multi-colored pills and poked them for a second before turning to the attending nurse. He said something to her in Korean and she pointed to a white pill marked "LOX". He turned back to me. "You can take this one out. And this small one, too, you can stop taking. It is a digestive." I wondered why I needed a digestive, but I didn't ask. After all, he told me to stop taking it. I didn't care much about what he told me NOT to take. So yesterday I took the two pills out of each packet, and saved the painkillers in case I needed them later. As I did so, though, I wondered what kind of painkillers they actually were. Then I started to wonder what exactly was in the OTHER pills I was still taking. This morning I pulled out the receipt that the pharmacy printed out for me, and used the Korean prescription names to discover their English equivalents. To my surprise, I discovered that the drug that he told me to take out (LOX) was actually loxoprofen, a non-steroidal anti-inflammatory. It struck me that, two days after surgery, this one might still be important to take. The digestive was actually the large green pill (marked BEARSE), which I was still taking (and which I suspect is the cause of the digestive trouble I had this morning). I was also still taking another antacid pill, which I suspect was thrown in for good measure, in case the misoprostol failed in its duty. Luckily, I was still taking the antibiotic (cefalexin). As it turned out, there was NO painkiller in the packet at all! Maybe I should be more pissed off about this. It seems like an honest mistake, though - the doctor wasn't trying to hurt me. Maybe he actually was trying to tell me to stop taking the anti-inflammatory, and I misunderstood. I'll ask him when I see him tomorrow. The real danger, in my opinion, is the practice of giving drugs out in little unmarked baggies. If you're visiting the doctor in Korea anytime soon, make sure to have the doctor spell out everything he prescribes you, and ask the pharmacy for a printout of the prescription information. I don't know if they can even do that, but, as in almost every life situation, it never hurts to ask. The non-steroid anti-inflammatory IS pain medicine- like Advil or Motrin. The stomach medicine and antacid were to protect your stomach from being torn up by the anti-inflammatory.It all actually makes sense. Thanks for clearing that up! The information I looked up on the drug didn't mention the painkiller part. I always ask what's inside and they tell me. And the contents are labelled (at least at the hospital I go to). But if it's not, you can ask them to ID each pill. Wow, that is dangerous. I don't know what I would do if I got pills in unmarked bags. I guess I would probably just do what you did. Wow, that is crazy! I wonder if people who come from Korea to North America think that the way we take drugs is bizarre too! Actually, it's fairly hard to get painkillers in Korea from my experience. I suffer from kidney stones, something very, very painful, and I've never been given a painkiller for the condition. They always give me antispasmodics and NSAIDs, and refuse to give me good painkillers. Even in the hospital. When you're in the midst of a kidney stone, it's really enraging. Next time feel free to ask any of healthprovider either doctor or pharmacists for detailed informations.